This harness kit will allow you to run a 3.6L - WA580 (NAG1) in any vehicle you so choose. You will need a complete 3.6L - WA580 4WD pullout powertrain with the complete factory engine harness still attached as well as the ECU, TCM and shifter. If you dont have a ECU, TCM or Shifter we can provide them as needed. 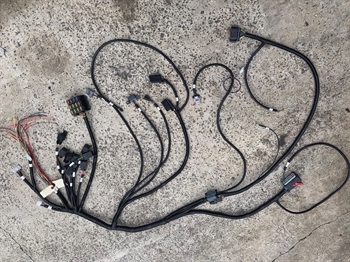 Our harness will plug directly into the C1 connector of the factory computer and your 3.6 engine harness will plug into the C2.